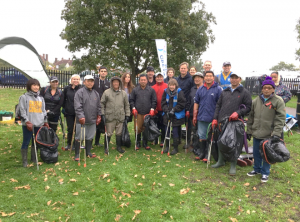 Join Thames21, London’s leading waterways charity, to spruce up Rushgrove Park. The Silkstream, flowing through the park, has large amounts of plastic litter in it and woody debris blocking the flow. We will have thigh waders so we can access all areas of the river. Help to create an inviting space for people and wildlife and improve your understanding of rivers, plants and animals at the same time. All welcome and all equipment will be provided. No experience necessary. Under 16’s need to be accompanied by a responsible adult. Families are very welcome! Please bring a packed lunch. Tea and Coffee will be provided. Meeting at the southern entrance of the park. Nearest road is the ‘Crossroad’.